We have made it our business to offer you more than just high-quality and elegant products and pay special attention to the small and fine details. That's why with our engraving option you can give your favourite pieces an individual and very personal character and have your leather engraved.A simple, classic accessory will become your unique companion in the finest craftsmanship - whether for business, leisure or travel! Special highlights and favourite products of our customers are the business card cases with engraving, the men's wallets with engraving and the passport cases with engraving - all made of the best leather and embossed by hand. How is an engraving actually created? Our master engraver Daniel is responsible for the engraving of our products. The process is not that easy, but Daniel knows all about it! He starts with the correct selection of the letters, the so-called patrices. The letters (also numbers) are clamped into the engraving machine in our in-house workshop, heated and pressed with feeling onto the desired product. "It is important that the letters are always centered. With gold or silver lettering, I additionally place gold or silver paper between the letters and the product," reports Daniel. 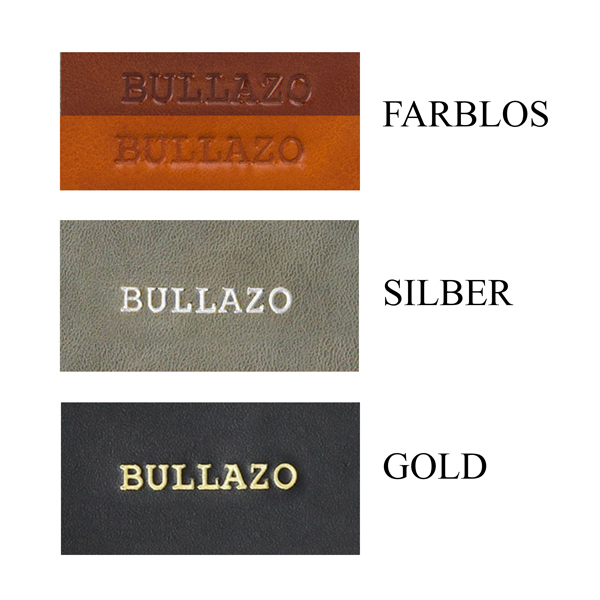 The individual BULLAZO product is ready! All leather products from our range can be personalized. Whether name, initials or short sayings - Daniel and our engraving machine make everything possible! How do you get your desired product with leather embossing? If everything appears as you wish, complete the order process by adding the item to your shopping cart and paying at checkout. If you would like to order the same item with different engravings, please send us in addition to your order an eMail with the desired engraving and the engraving type to info@bullazo.de. Product with engraving ordered - and now? Now your favourite product, such as your wallet, business card case or passport case, is enhanced with a lot of love and attention to detail with the hand press. The letters are carefully placed on a heated stamp and pressed onto the leather with great precision in the hand press. If no foil is used, the so-called blind embossing, i. e. a colourless engraving, is created. If you have selected the colour gold or silver as the type of embossing, then gold leaf or silver foil is used in the hot foil process. No matter whether you have chosen the wallet, a card case, passport pouch, business card or document folder or an iPhone or iPad cover: the result is something you can be proud of and turns your new achievement into a personal, noble unicum. Please note that deliveries with engraving take 5-7 days to complete, as each product is engraved individually and personally. In urgent cases, please contact us at info@bullazo.de for further information. For simple engravings we charge a surcharge of 14,99 €. This amount is automatically added to the item price when "Personalization" is selected. Where is your product engraved? The position of the engraving depends of course on the selected product. As soon as you have ticked the "Personalization" checkbox on the product page and have entered the text for your engraving, you can see the engraving preview in the image view. For special requests, e. g. if you need more than 30 characters, please contact us at info@bullazo.de Two-line engravings are also possible.